Are you seeking a rewarding career with a little challenge? Welcome to the world of commercial real estate! A career in commercial real estate offers many rewards, including the ability to set your own schedule (no weekend open houses), meet new people, learn about different businesses, and more. In commercial real estate careers, you will have the opportunity to sell or lease anything from a small office space to large industrial properties. You will also learn about different businesses to help meet the client’s needs. No day is typical in the commercial real estate office. You set your schedule. Whether it is cold calling, meeting with new or existing clients, or showing commercial space, every day is different. Some activities you will participate in include: cold calling for new/prospective clients, conducting property searches for clients, follow-up calls, showing commercial space, meeting with building owners/managers, and property management. Whether you are a newly licensed or seasoned agent (residential or commercial), we at McCormick Real Estate and Management will provide you with our current inventory of properties and contact information, assist you in your first meetings with current clients/property owners, provide office and marketing support, and assist you in developing new leads as you advance in developing your real estate career. Pittsburgh real estate rental management is booming as well. 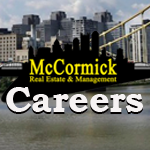 Commonly called property management, many Pittsburgh commercial real estate owners elect to have McCormick Real Estate and Management handle their property management for them. It just makes sense. We are knowledgeable in all areas of commercial, residential, and industrial real estate management. So why not go with a professional at McCormick Real Estate and Management. For more information on any property in Allegheny County, you can investigate them through the Allegheny County Real Estate website. DESCRIPTION: The Commercial Real Estate Agent assists clients with the sale, purchase, property management, or leasing of commercial properties including, but not limited to, office buildings, vacant land, and multi-unit structures. This job description is intended to convey information essential to understanding the scope of the job and the general nature and level of work to be performed. It is not intended to be an exhaustive list of qualifications, skills, duties, responsibilities or working conditions associated with the position. I am able to perform the duties of this job function with or without reasonable accommodation.